Does something seem off about this map? Maybe Amsterdam is a little too far inland? Maybe the coastline is a bit too squashed, or the sea a bit too narrow? No. This map is fine. The problem is with you. Think of it as a riddle: what mistake are you making in reading this map? Hints (after a fashion) here and here. If you give up, the answer to the riddle is here. This entry was posted in Uncategorized and tagged geography, puns. Bookmark the permalink. Vg’f n syvccrq znc bs puhax bs gur HF rnfg pbnfg, abg Rhebcr? Jryy, gung pbzcnff ebfr vf pbairavrag, vf vg abg? Indeed, I’m not sure that I would have solved the puzzle without it. Argh, I gave up too close to the finish line. V’q svtherq bhg gb qvfertneq gur pvgvrf, naq syvccrq gur znc nebhaq, ohg fbzrubj Arj Oehafjvpx guerj zr bss rabhtu gb snvy gb abgvpr gur qvfgvapg Ngynagvp pbnfgyvar. V’z tbvat gb thrff gung guvf vf npghnyyl bar bs gur Oevgvfu vfyrf, jvgu gur pvgvrf boivbhfyl abg npghnyyl orvat gur snzbhf barf ohg bguref jvgu gur fnzr anzrf. V unq gur vqrn, gubhtu qvqa’g guvax vg guebhtu rabhtu gb ernyyl trg vg. V xrcg ybbxvat sbe Nguran, Trbetvn. Aopz jvttlua pz hizvsbalsf zbwlymsbvbz. Uv ullk av kljyfwa pa ha hss! Zapss, pm fvb’yl ylhkpun pa, P’t uva lehjasf zbywypzlk (P’cl ivsklk aol shza dvyk av thrl aol jvttlua zllt zbwlympjphssf tvyl sprl vaolyz hivcl pa). Aopz pz dof yva13.jvt npclz bz vwapvuz. You forgot to add Brockway, Ogdenville and North Haverbrook to the map. What threw me for a while is that Amsterdam isn’t far enough inland. Its dot should be just under the R in its name. The map is planar. The Earth is not. Hence your claim that the map is perfectly accurate with no distortion cannot be true. You need to view it on an old CRT screen; that’s curved. Also, the compass isn’t indicating which direction is north. That’s just one thing that’s missing from a completely accurate map. More significantly, the Fnvag Ynjerapr Evire is much too wide where it joins Ynxr Bagnevb. As a non-American, I definitely wouldn’t recocgnise the geographical feature without a whole lot more context. As a non-American (who failed the original riddle), I’m very confident I would. There is a “Far Side” cartoon in which aliens recognize that feature on Earth as something native to their physiology and call it that, but darned if I can’t find it with a Google search. Also, I just noticed [ROT13] gur Fg. Ynjerapr evire vf frireny gvzrf jvqre guna vg fubhyq or, gb znxr vg ybbx zber yvxr gur Zrqvgreenarna Frn. Urer’f n pbzcnevfba vzntr. I couldn’t solve it. 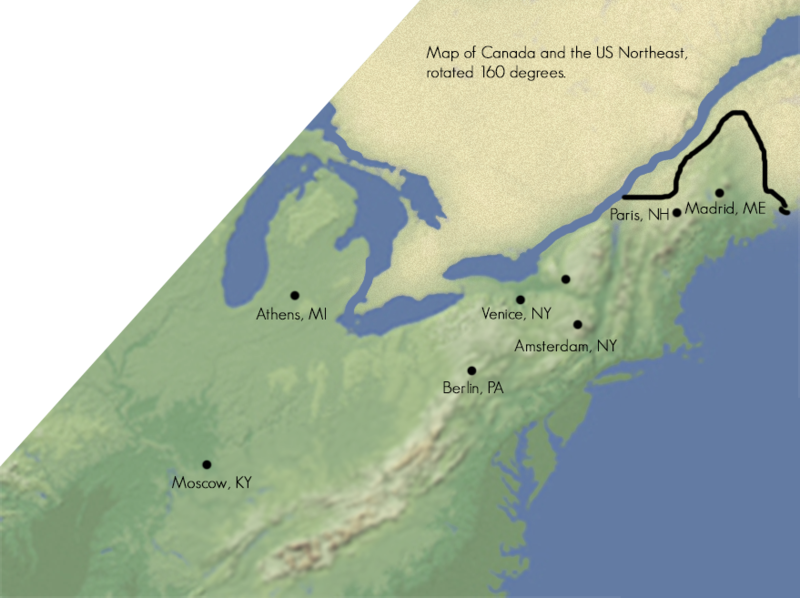 The best I could do was: Europe during the Ice qge when the sea level was lower and with the location of modern cities. On the flip side, I totally understood that the compass was hiding something important and that the label on the top left was there so that there could be ambiguity on whether the UK was there or not. What threw me up was the compass. I wasn’t able identify the coastline by sight, but the very distinctive shape of the bodies of water is unmistakable (moreso when you flip the map vertically, which I did). Nice touch. Same, except I was thinking it was Europe pre-millions of years of continental shift, because Paris is way too close to Madrid and far from Amsterdam. Also, the Mountains are totally wrong (showing the mountains in southern Poland/Czechia/Slovenia but not the taller Alps?! ), and Italy isn’t there in the ways you’d expect that would allow it to “drift” into its current shape. I feel like there’s some sort of lesson here about technically accurate, but selectively edited information. Like, if the (literal or conceptual) borders of the thing you’re allowed to see are oddly shaped, suspect deception, intentional or unintentional. The thing I find most impressive about this is how automatically I gloss over things like the legend and the compass. Years of reading maps has taught me to check the information in the legend and check whether North is slightly askew, but it’s also taught me not to jbaqre jul gur pbzcnff naq gur yrtraq unir orra cynprq jurer gurl ner naq znqr boabkvbhfyl ynetr. Abe gb pbafvqre gung “Abegu” zvtug abg or hc-vfu. I’m from the region that you mention towards the end, but I’ve never heard of those things that you mention at the end either. It’s funny, because there are often similar ones in different locations (Cnevf, Grknf, for example) that are better known. Once I guessed the trick, I initially expected the more famous ones to be relevant, and although I remained confident that I was correct, I couldn’t verify any of those details from my own knowledge. So what’s the extra dot in the answer about? Heh. I thought I had the answer, but I was completely wrong. This is possibly a result of my hazy geography skills and not measuring properly just how far off the cities appear from where they should be. Biggest problem: Thinking of this as projection problem when obviously posted by psychiatrist who doesn’t know much about projections. What makes you think Scott doesn’t know much about projections? I don’t see any indication either way, unless it’s just that the map was claimed to be undistorted when this can’t be truly said for any map – but that’s something pretty easy to overlook. I assume that no one without degree in math-heavy field has worked with projections (in mathematical / computer graphics sense, not cartographic sense). Could be that my priors are skewed. I think you might be projecting unfairly onto Scott here. My guess was “It’s where those cities would be if we looked at that part of the world some large number of millions of years ago.” That guess was wrong. I discarded this because I couldn’t imagine a scenario where the Carpathian/Sudetes mountains exist with no trace of the Alps. Hint of a sort: the location of the compass rose (i.e. what it’s covering up) was a damn dirty trick without which I would have solved this easily. The map is *not* accurate; there is something seriously wrong with the city names. The city names are accurate. Yeah, my thought before I gave up was “what if this was the earth viewed at an angle”. Not sure if that would count as a distortion, but wrong regardless. Too bad that that the Unsong hint is not one of the chapters on Enochian. I’d seen a joke along these lines just a couple of days ago, and got Scott’s riddle very quickly. Baader-Meinhof effect FTW. And here I thought it was Atlantropa. I’d be interested to know what was it that helped other people who figured it out? Once the answer told me which continent I was looking at, the Chesapeake was super obvious. Slightly less so were Long Island and Lake Erie. It was Cape Cod that gave me the clue. I feel like I should get points for “Guvf vf abg erzbgryl n znc bs rhebcr, vg’f fbzrguvat ryfr ragveryl,” even though I didn’t at all recognise what it actually was. My best guess other than that had been something like sea levels, given that the land looked *completely* different to actual europe. But that didn’t look likely either. I considered other map projections, but didn’t look like anything would plausible produce that even given how distorted europe is in mercator I’m most familiar with. Europe in a Mercator isn’t particularly distorted; in fact I’d say it’s one of the least distorting projections for it out there. Mercators distort size, but their conformal property – angles are preserved – means it does a good job with all but the largest shapes (it mangles Russia, but Russia is both huge and close to a pole, it’s very hard not to mangle Russia). Greenland is ridiclously huge on a Mercator, but it is at least pretty Greenland-shaped, which is far more than can be said for certain other projections. Go to Google Maps, zoom out, compare the map view (a Mercator) with the satellite view (a globe). The Mercator makes Southern Europe look a little small and Scandanavia look a little big and a bit too pointy, but it does a pretty good job. Got it, but only because of gur pbzcnff ebfr uvag, naq nsgre fbzr enaqbz ebgngvba va Cubgbfubc. Sbe n juvyr V jnf fher gur Qryznein Cravafhyn jnf Qraznex. My first guess was that it was a close-up of a US state, like Texas or New York, which has a lot of towns named after European cities. It didn’t occur to me that the map would use cities from different states. Somehow that seems like cheating. I had a similar thought, than dismissed it because they lined up pretty well with the Atlantic Ocean and Europe, and didn’t think they’d have counterparts that did so here. Of course, it really can’t be Europe because there’s no Finland and the Mediterranean doesn’t really look like that, so I should have stuck with it. Doesn’t “drawing a giant river that is absolutely not to scale with the rest of the bodies of water/land” count as a distortion? 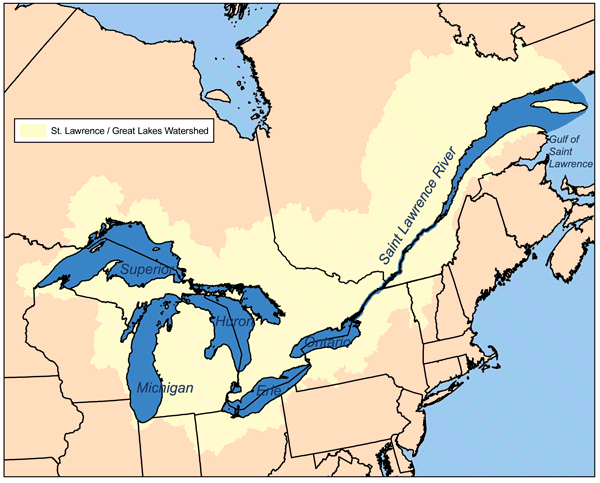 The St. Lawrence river (between the US and Canada) is absolutely not that wide. Compare with Lake Champlain, which shows as a much smaller blue section near Paris; the lake is significantly wider than the river in real life, but in the image the river is much larger. I think the image designer (Scott?) drew the river in by hand, considering how sharp the edges of the blue are when compared to the significant feathering/blurring on the rest of the coastlines, and how uniform the width is in the image (when in reality the river narrows and widens as it goes). Go to Google Maps and zoom out from Montreal with satellite mode on (no labels for extra clarity) and it becomes super obvious how not-accurate the representation of that river is. Yeah, the St. Lawrence’s crazy width plus the rendering of Canada as featureless desert, combined with the reassurances that the map was distortion-free (a bold lie), tripped me up pretty hard. Hamburg and Hanover could go onto that map quite nicely. Vienna (gur bar va Vaqvnan)? St. Petersburg? Nah, that would give it away. At first I thought this was one of those maps where distances are proportional to travel time by public transportation, but half a second later I realized there’s no way it takes less to get from Paris to Madrid than to Amsterdam by train. Jr’er ybbxvat ng n ivrj bs Arj Ratynaq, syvccrq ebhtuyl abegu gb fbhgu. Gurer whfg unccra gb or n ybg bs yvggyr gbjaf anzrq nsgre Rhebcrna pvgvrf. I got partway there. I figured out that the cities were not the obvious ones, and this is likely a zoomed in version of somewhere else, but didn’t think about rotating it. Funny, I got the exact opposite. I thought of rotating it but nothing else. Reminds me of how Wilson lost at Jeopardy. Dude, it pretty much says on the tin that the map isn’t what it seems to be. This isn’t a trick question. Nothing but the Atlantic Ocean is called ‘Atlantic Ocean’. Naq vs vg’f abg Rhebcr, ohg vg vf n cynpr jurer pvgvrf unir Rhebcrna anzrf, gura vg zhfg or gur *jrfg* pbnfg bs gur bprna. Fb V ghearq gur znc nebhaq, yvarq bs hc jvgu gur pbzcnff ebfr, naq erpbtavmrq gur pbnfgyvar vzzrqvngryl. Haha, joke’s on you! I’m terrible at Geography so this map looks just fine! GVY gung gur jbeyq qbrf abg raq ng gur abegurea obeqre bs Znvar. Unq gb syvc zl yncgbc hcfvqr-qbja *gjvpr* orsber V fnj vg. The DMV peninsula is an extremely distinctive shape. Saw it, saw NJ, done in about fifteen seconds. Heh. I didn’t guess right, but that was a fun riddle. The map is accurate, but not precise. The lack of precision introduces ambiguity, which is further exploited by using an unfamiliar orientation. So the problem is with the reader? Nah. The problem is with the author who has set out to confuse people with ambiguity born of imprecision, and thinks that doing so is clever. It isn’t. It’s boring. The upside-down Delmarva peninsula was a dead giveaway. Also any map contains distortions as a a result of being a projection of parts of a spheroid on a plane. Well, I see it now, of course, but without the answer this peninsula was not a bad match for the expected shape of Denmark, just as pncr pbq is a pretty good fit for Brest. A cute puzzle. I got the map immediately (I’ve spent a fair amount of time in New England where every sleepy town has some international sounding name) but what’s with the nonsense characters everyone’s writing in the comments? Or just get a rot-13 bookmarklet. Black Speech. Give your heart and mind to the Great Old Ones and it’ll all make sense. Alternately, the d3coder plugin for Chrome can handle it. Firefox et al. probably have something similar. That wasn’t so much a riddle as it was just a kind of trick. Lame. Scandinavia’s gone, the Mediterranean looks like a river… oh, and then I remembered how many funny-named cities there are on the East Coast. Honestly not that difficult so long as you know how the “thing that appears to be one thing is actually another thing with the same name as the previous thing” trick works. And that’s all it is: a test to see if people are familiar with that one trick, and maybe know a couple place-names on the East Coast. Some people aren’t, and they fail the test. Some people are, and they figure it out. Oh well, it wasn’t the worst way to spend a couple minutes. I simply figured that the assumption was “that this is a map of planet Earth”. There’s no reason it couldn’t be a map of a fictional location.